...in a former wine estate located in Provence ! Domaine du Crestet is a former wine estate located in Provence, 35 km east of the Rhone River and 3 km south of the old roman town Vaison-la-Romaine which is a nice little Provencal town with multiple shops and restaurants, a roman amphi theatre and well known archaeological sites. It consists of 4 provence-style buildings situated around a central court, in the middle of the vineyards with non-obstructed staggering views to all sides, including the Mont Ventoux, well known for the Tour de France, and the mediaeval village of Crestet. In three of the buildings six carefully styled vacation houses are created that are aimed at providing the guests a high level of luxury in a authentic Provencal setting with 50 cm thick stone walls, roman tiles and exposed beamed ceilings. Each of the houses has a private entrance, terrace with bbq and sun awning, a garden facing the vineyard, a comfortable living room with fireplace (except Cinsault), a "chef-proof" kitchen including refrigerator, freezer, 4 gas burners, oven/grill/microwave, coffeemaker, water cooker, mixer, etc. 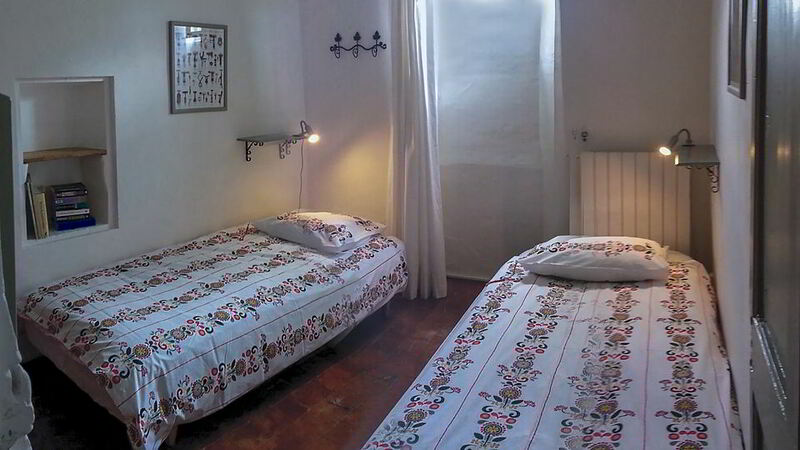 Furthermore they have central heating and 1 or 2 bathrooms and 2, 3 or 4 bedrooms with high quality beds. You will also find in every house a washing machine, dryer, dishwasher, an iron, a satellite TV/Radio, DVD/CD player, as well as a WIFI internet connection. Our 12 x 7 m plus 3 x3 m swimming pool is surrounded by lavender and vines and has a view on the Mont Ventoux. There is a court de petanque, and the tennis court at walking distance allow for even more fun. 80 meters to the east is the restaurant La Loupiote which provides great local menus at affordable prices. There is a bakery with fresh croissants every morning within a 200m walk, and there are two other restaurants within 1200m. Multiple hiking and biking possibilities start at the domaine: Dentelles de Montmirail, Mont Ventoux, Les Baronnies and the canyon of the Toulourenc. Otherwise you will find much history, culture as well as the best of the Côtes du Rhône wine region, you are very close to Gigondas, Rasteau and ChateauneufduPape. Upon request we can organize a wine purchase excursion (except in July and August). Grenache sleeps 4 and has the kitchen, living room with high ceiling and fireplace, toilet, terrace (4x5 m) and garden on the ground floor, with a southwest view towards the vineyard and the historical village Crestet. 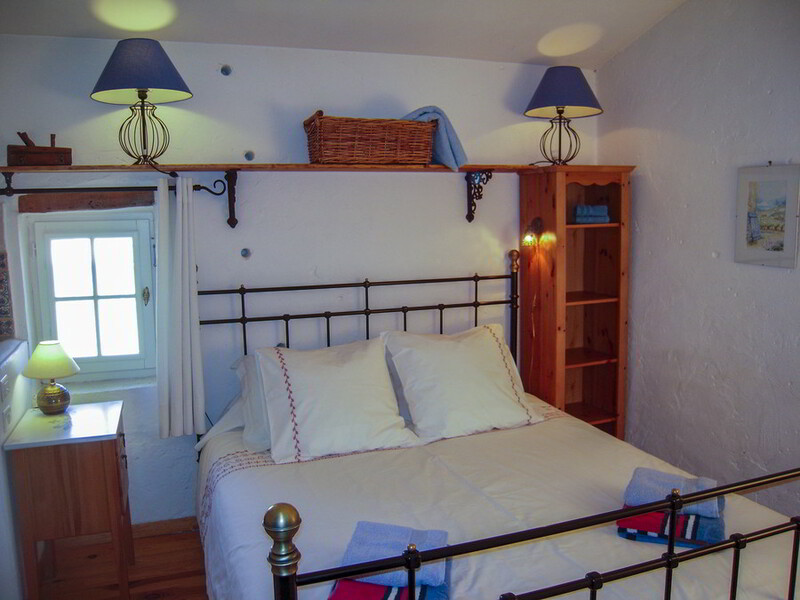 The Grenache house has the two bedrooms with high ceilings on the 1st floor, one with a double bed and one with two single beds that can be put together. Each bedroom has its own shower and washbasin. There is a second separate toilet in the hallway. Syrah sleeps 4 and has the kitchen, living room with fireplace, toilet, terrace (4x5 m) and garden on the ground floor, with a southwest view towards the vineyard and the historical village Crestet. The house has the larger bedroom with high ceiling and a double bed, a separate full bathroom and 2nd toilet in the hall way on the first floor. The second bedroom with two single beds, that can be put together, is on the second floor. Syrah and Grenache can also be rented as one big combination house interconnected by their living rooms. The Cinsault house sleeps 4-5 and is completely located on the first floor. Access is provided by an outside stone stairway to its terrace, which has an exceptional wide view. The living is spacious with a high ceiling with ceiling fan, and it has the fully equipped kitchen attached. 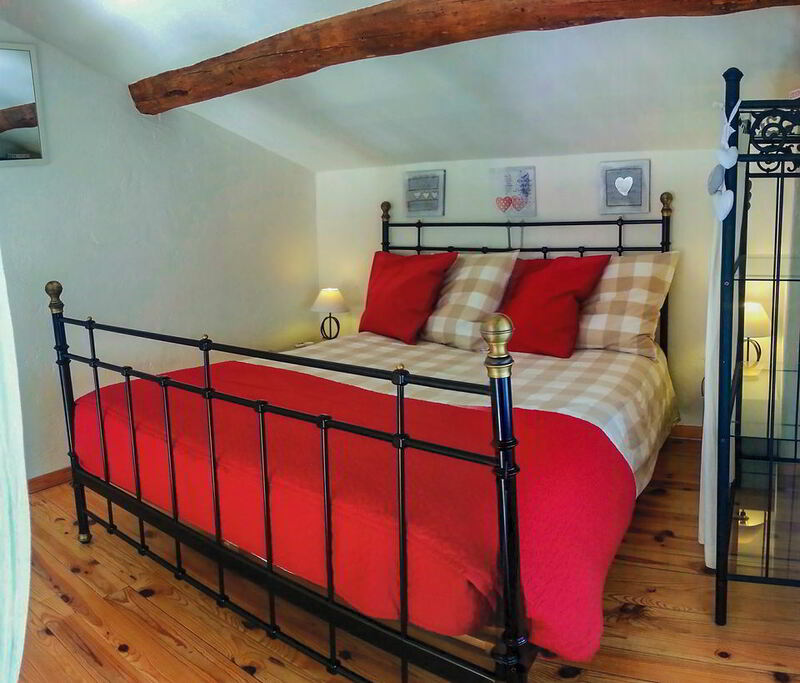 The large mezzanine with a double bed provides one of the two bedrooms. From this bed you can see the sun rising behind the Mont Ventoux every morning. The other bedroom has two single beds that can be put together and a smaller bunk bed (80x180 cm). It has a full bathroom, shared by the two bedrooms. It has no private garden but a very nice private patio (4 x 5 m) on the first floor that gives a beautiful and unique view to the east, south and west including the Mont Ventoux, the vineyard, the historical village Crestet and the inner court. Olivier is a 5 person house located on the ground and first floor. The ground floor of Olivier has high ceilings with ceiling fans and provides a living with fireplace, kitchen, spacious bathroom with toilet and shower and a double bed bedroom. There is bedroom with three single beds on the first floor. Its terrace and garden are on the southeast side with view over vineyards and Mont Ventoux. The entrance and dimensions on the ground floor are such that the house is easy accessible for a wheelchair. Upon request additional features can be installed to comfort the handicapped user of the house. Upon reservation, assistance by certified English speaking nurse can be organized. The spacious Murier house sleeps 8. It is located in the old Bergerie and has 3 bedrooms (one with a double bed, one with two single beds that can be put together, one with 2 single beds that can also be put together + 2 single beds sleeping high/low), 2 bathrooms (one with a full bath attached to the two single-bed bedroom, one with shower and toilet), separate toilet, spacious living with large fireplace, kitchen with dining table, terrace facing south with view over vineyards and Mont Ventoux, and another terrace facing west towards the historical village of Crestet. All rooms have high ceilings and the bedrooms have (ceiling) fans. 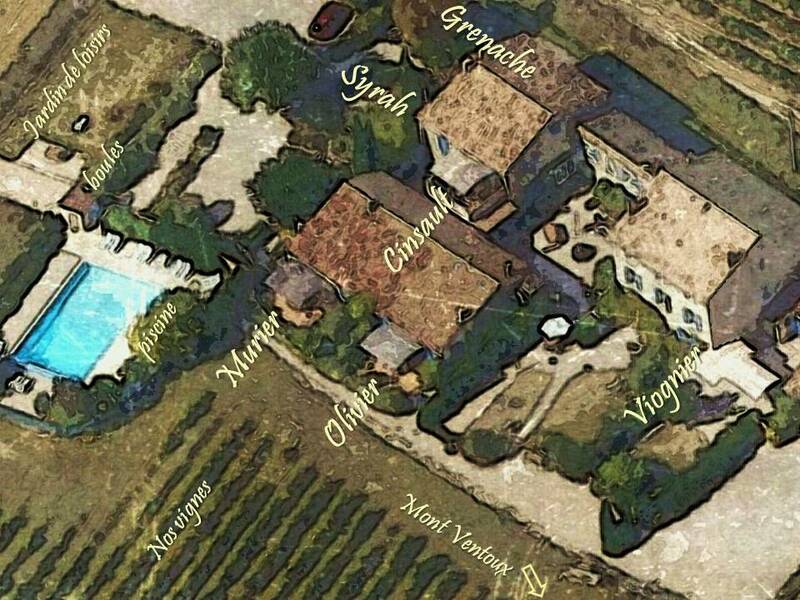 The Viognier house sleeps 8 and is situated in the "Maison de Maître" of the Domaine. This prestigious home has many special features and style elements from the glory days of the Domaine. It has a surface of 170 m2 divided over 3 levels. On the ground floor there is a very spacious and luxurious kitchen with dining area, a living room with a beautiful fireplace, and a toilet. Through the stately Provencal staircase you arrive at the first floor with its large master bedroom with a large bathroom en-suite equipped with an Italian shower and a separate toilet. On the third floor there are 3 bedrooms, a bathroom with shower and a separate toilet. All bedrooms can have a double bed or two single beds. Outside, in front of the house viewing south, there is a private courtyard of 85 m 2 with a sun awning of 27 m2, and a private garden of 78 m 2. Viognier has also a private garage for bikes and parking next to the house. Home and garden offer a view of the vineyard with behind it the Mont Ventoux and the hills of the Dentelles de Montmirail. 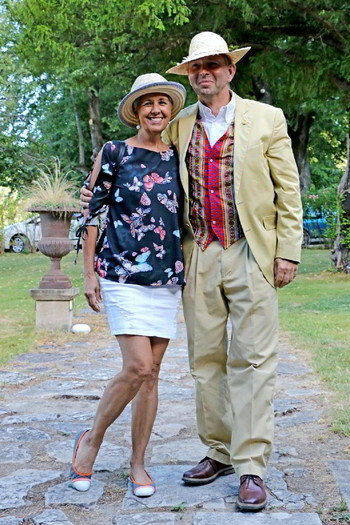 In 1983 we married in our family vacation home in the Ardeche and since 1999 we live and work with our family in Provence. With a lot of love and personal commitment we have renovated in Crestet and Rasteau a former wine estate and a large villa to offer you the characterful holiday home we have always searched for ourselves. Our international architectural work experience and education has helped a lot. 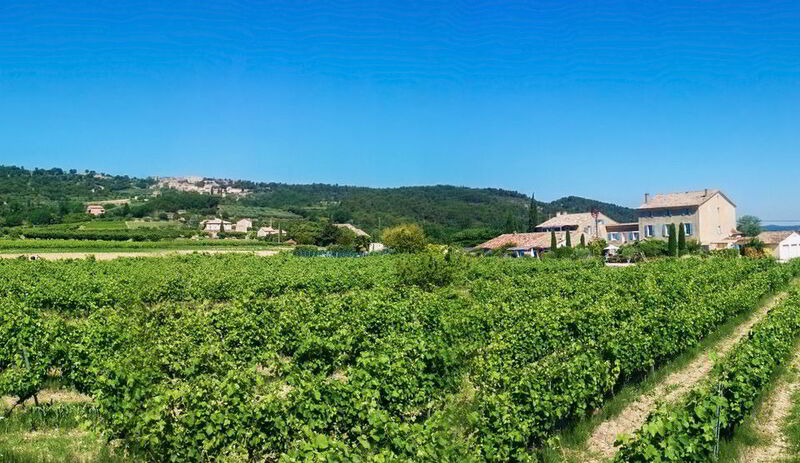 We are great wine lovers, love good food, family and friends, hiking and cycling in the beautiful nature around us, and enjoy the history and local life in the villages here in the Vaucluse. We love to share our experiences with our guests! 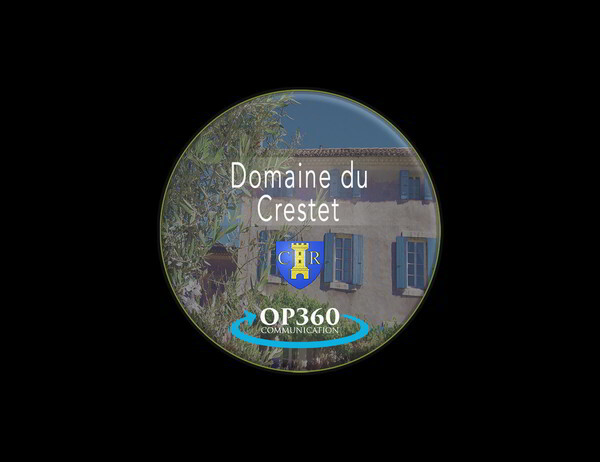 Welcome to Domaine du Crestet! Want more references? More than 75 references from our guests in various European languages are available on 4 portal sites. Our average score is 9.8 out of 10. Below you find the links.You can also inquire about Domaine du Crestet at the town hall of Crestet. Our houses are specially known for their cleanliness and charm. More information about the background of your host Paul Kluijtmans can be found on LinkedIn. Prices are per week and include electricity, heating, internet connection, water, electricity, firewood, base set of kitchen and toilet linen & soaps, taxes and 3 hours of tennis (please bring your own rackets). Our invoices are all in €. The £ and $ prices are only an indication. An open week for the “sleeps 4-5” houses means that at least one of the Grenache/Syrah/ Cinsault/Olivier houses is still available. A security deposit of 300 € and one time cleaning fee of 60 € per house (85 € for Murier, 110 for Viognier) plus a mandatory bedlinen fee of 11 € per week per inhabitant is due upon arrival. Towel package (optional) 9 € per week per inhabitant. Dogs are allowed without charges upon individual approval. For November, December, January, February and March shorter lets with a minimum of 4 nights are possible. We can communicate in English, French, German and Dutch.